GlassWorks widely regarded as the main glass company and installation experts of architectural glass through the Greater Chicago Metropolitan Area for over 37 years. In addition, we are happy to take enormous pride in our superb glass shower enclosures. It is not very much of a shock that GlassWorks is seen as the conclusive spot for customers who are seeking the greatest shower enclosures and glass shower stalls. Regardless of the sort of glass shower enclosure you need, GlassWorks has the ability and awareness to take care of every one of your glass shower enclosure needs! Since 1997, we have been providing our outstanding, best-rated services to Highwood locals together with our broad selection of glass shower enclosures and glass shower stalls. Essentially, we are revealed as serving about 4,000 customers on an annual basis! Highwood, Illinois is a city found in Lake County and has roughly 5,400 residents. Glenview, where you can find GlassWorks, is easily found around 13.6 miles southwest of Highwood. Whenever Highwood residents are in the market for glass shower enclosures or glass shower stalls, they ask for the assistance of the industry pros at GlassWorks. Our streamlined and sophisticated shower enclosures will provide a degree of splendor and excitement to Highwood baths. Therefore, Highwood citizens are knowledgeable that GlassWorks is competent to customize their glass shower stalls and shower enclosures to their exact wants. Also, although our glass shower enclosures and glass shower stalls provide a visual appeal of class to bathrooms, but our shower glass is typically called “safety glass” that guarantee that bathers are safeguarded within the strengthened shower glass structure. Also, customers are often happy to learn that GlassWorks provides them with reasonably competitive and cost-effective prices. 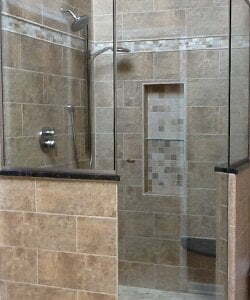 No matter what variety of glass shower stalls and shower enclosures you require, from frameless glass shower doors to neo-angle glass shower doors, glass steam shower enclosures, framed glass shower doors and custom glass shower doors, you can always depend on GlassWorks to manage your requests quickly and effectively. Additionally, our GlassWorks’ installation technicians always handle customers’ homes like they do their own! To schedule an appointment, fill-out our online form to receive a 10% price savings, or contact GlassWorks at: (847) 729-5580 to get your FREE ESTIMATE!